The SS fascinate us till this day not only because of their blind loyalty to Hitler, but also because they were ruthlessly efficient. Below are some snippets about them. Read on. 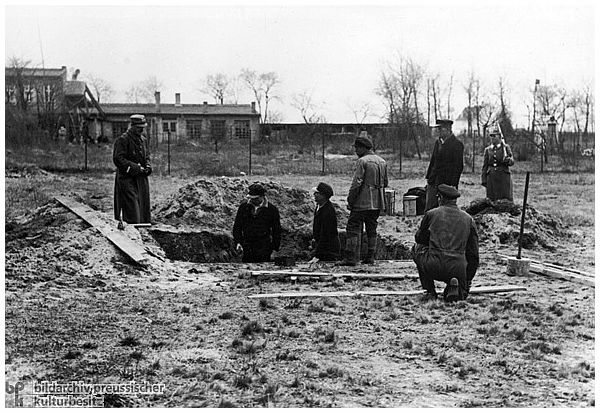 In the spring of 1933, Himmler, then Munich's chief of police, ordered the opening of the first concentration camp [Konzentrationslager or KZ] in nearby Dachau. The camp was to provide "protective custody" for Communists, Social Democrats, and other political opponents of the regime. Soon a network of camps stretched over all of Germany. After the war began, the network extended into Nazi occupied territories as well. The camp system was one of the most effective instruments of SS and police terror: political as well as racial and social enemies of the regime disappeared into them for days or even years without any form of legal protection. 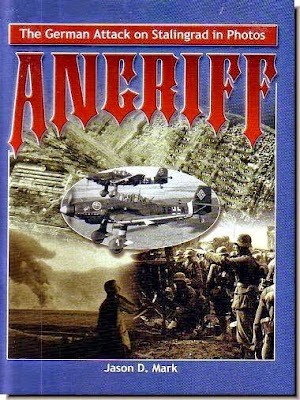 The Nazi leadership made no secret of the existence of the camps. Scenes such as the one shown below were supposed to send a message that inmates were actually to blame for their own fate. 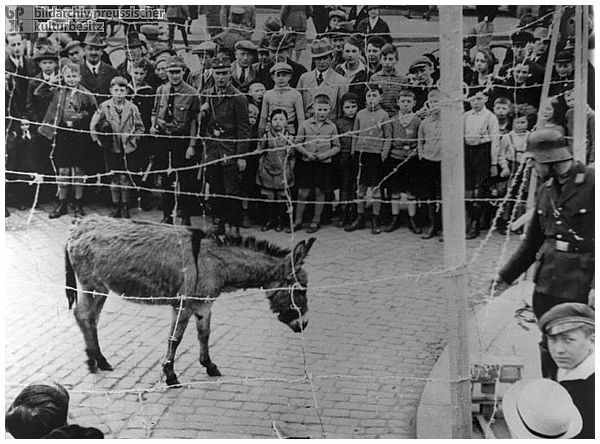 The message in this case was: “Only a stubborn mule ends up in a concentration camp.” People who followed the rules supposedly had no cause for concern. 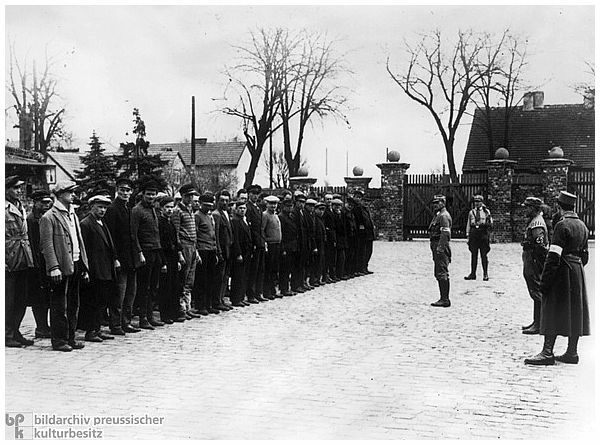 Prisoners during Roll Call at the Oranienburg "Protective Custody Camp" Near Berlin. Most concentration camp inmates were political opponents, so-called enemies of the race, common criminals, homosexuals, or “asocials” whom the Nazi leadership would not tolerate in the new German national community [Volksgemeinschaft]. The goal was not to rehabilitate prisoners, but rather to punish them by means of daily humiliation, arbitrary violence, and forced labor. Additionally, camps were supposed to have a deterrent effect on the rest of the population. The surveillance, torture, and exploitation of inmates was carried out by special SS units, the so-called SS Death's Head Units [Totenkopfverbände or SSTV] under the leadership of Theodor Eickes. Prisoners at the Oranienburg "Protective Custody Camp" near Berlin, 1933. 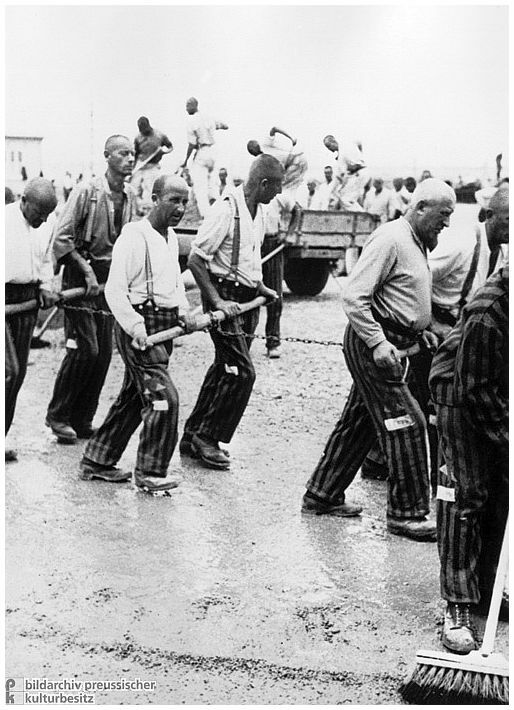 Prisoners Doing Leveling Work at the Dachau Concentration Camp (1933) . In March 1933, Heinrich Himmler (then Munich's chief of police) opened the first concentration camp [Konzentrationslager or KZ] in nearby Dachau. The facility was supposed to provide "protective custody" for Communists, Social Democrats, and other political enemies. Soon hundreds of concentration camps modeled on Dachau were being built throughout the country. Heinrich Himmler was an advocate of racial myths, occultism, and esoteric ideas. He founded, for example, the German Ancestral Heritage Association [Deutsches Ahnenerbe e.V. ], a group that engaged in pseudo-scientific research projects on the descent and characteristics of the “Aryan race.” Himmler also regarded his SS as an ancient Germanic clan, and endowed it with a series of pagan or pseudo-medieval symbols and rituals. 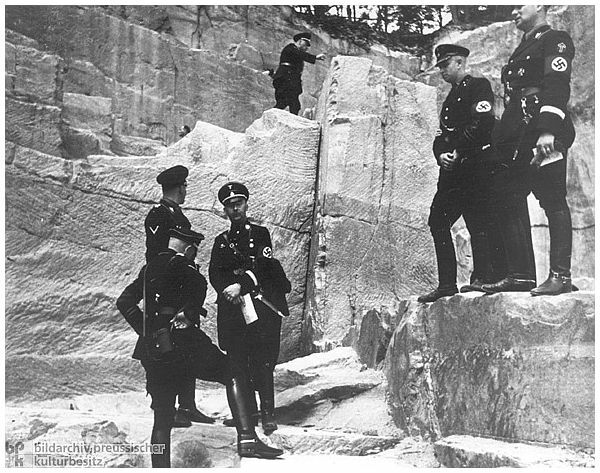 This photograph shows Himmler (center), SS Colonel [Standartenführer] Weisthor (at right, above Himmler), and others at a quarry in the Palatinate. At the time, Weisthor was head of the department of early pre-history and early history at the Main Office of Race and Settlement (RuSHA); he was also considered an expert on ancient German runes. Weisthor, whose real name was Karl Maria Wiligut, was later unmasked as a charlatan and an escapee from a mental hospital. 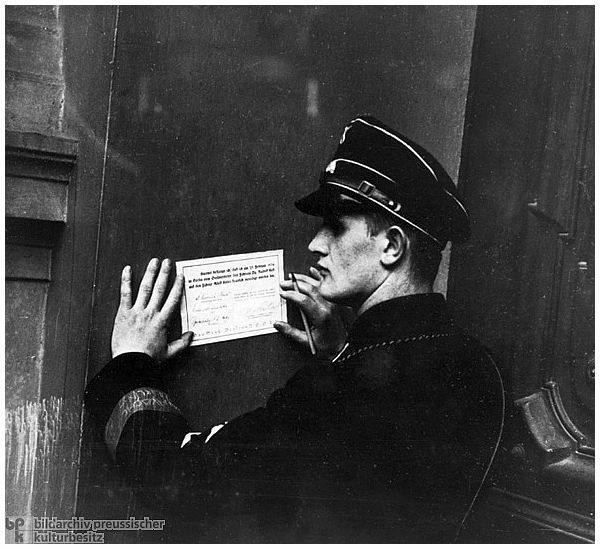 He was expelled from the SS in 1939. 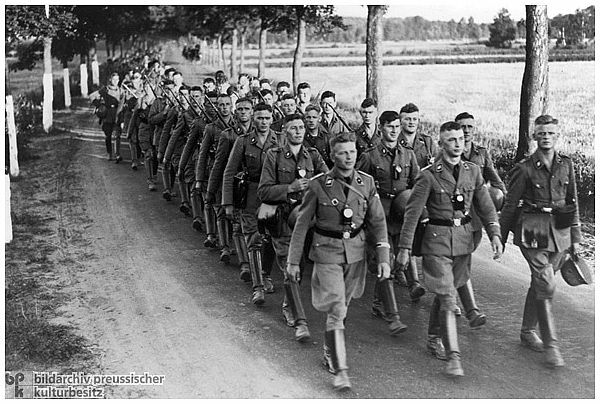 Hitler's Bodyguard Regiment [SS-Leibstandarte Adolf Hitler], 1936. The SS-Leibstandarte Adolf Hitler (LSSAH or LAH) was Hitler’s bodyguard regiment; it was one of the many specialized groups and paramilitary organizations that developed within the SS during the course of the Nazi dictatorship. Hitler founded the LSSAH in March 1933 to protect members of the regime and government buildings; it was a private army under his personal control. Its first major action was "Operation Hummingbird," which saw the elimination of the SA leadership on the evening of June 30, 1934/July 1, 1934. After the war began, the LSSAH was incorporated into the Waffen-SS and deployed under army command on both the Eastern and Western fronts. 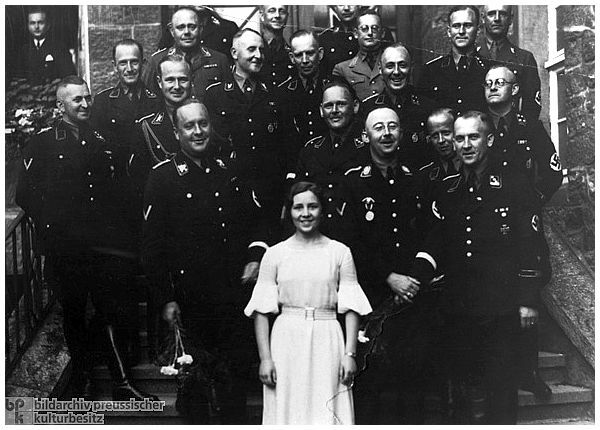 Group Photo of an SS Wedding, 1936. 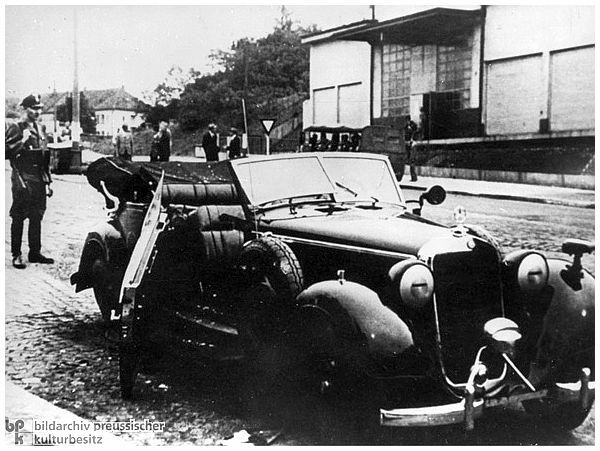 On the morning of May 27, 1942, Reinhard Heydrich, who was then Reich Protector of Bohemia and Moravia, was seriously wounded in an attack by Czech resistance fighters. He died eight days later in a Prague hospital at the age of thirty-eight. Heydrich played an important role in developing the SS into the Nazi dictatorship's most important instrument of terror. He was also a key contributor to the "Final Solution of the Jewish Question." On January 30, 1943, Ernst Kaltenbrunner was named his successor as head of the Reich Security Main Office (RSHA). The so-called Lidice Massacre is probably the best-known Nazi retaliation measure in connection with Heydrich's assassination. The inhabitants of the village of Lidice, about 500 in number, were falsely accused of having harbored Heydrich's attackers. 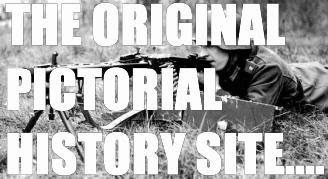 During the night of June 10, 1942, German police and SS units surrounded the village. All men over age 15 were shot, and the women and children were sent to concentration camps. 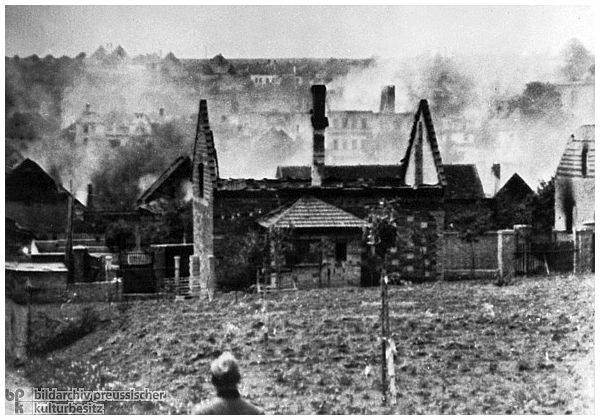 Then Lidice was burned to the ground. Formally, the SS was a purely male organization. Women were accepted into the "clan" through marriage with SS-men, but they had no organizational rank or function. Their job was to raise children and manage the household. 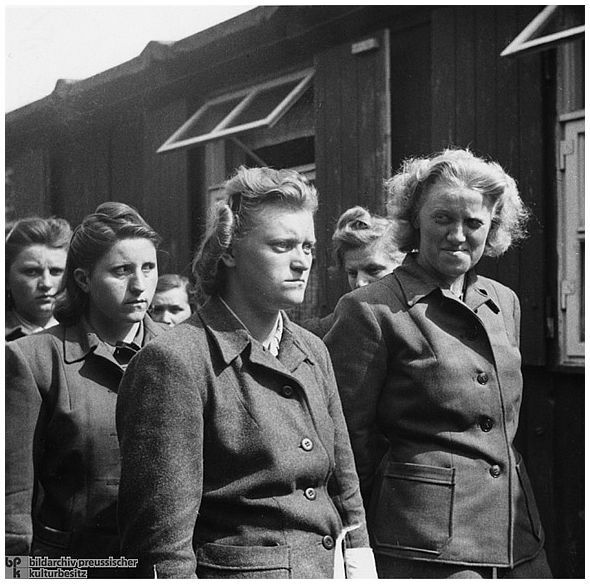 But that being said, as members of the SS entourage, women were also called on to work as concentration camp guards and in a range of service positions. After the war began, the number of SS female aides – initially as volunteers, later as forced recruits – rose sharply. The photo shows, among others, camp guard Irma Grese (last row, left) after her arrest by British troops. Grese had distinguished herself by her extreme brutality as a guard at Ravensbrück, Auschwitz-Birkenau II, and Bergen-Belsen. In the first Bergen-Belsen Trial, she was sentenced to death for the abuse and murder of camp inmates. She was executed on December 13, 1945, at the age of twenty-two. Also shown are concentration camp guards Magdalene Kessel (second row, left), Irene Haschke (front row, left) and Herta Bothe (front row, right). Both Haschke and Bothe were sentenced to ten-year prison terms.